Having only relatively recently found my way back to drawing and painting following many years in business (see About me), my gallery of work is as yet somewhat small, but hopefully the images below will give a flavour of my style of painting and preferred subject matter. Whilst gradually developing my portfolio of original work, I take private commissions for paintings of both wild and domestic/ companion animals. If you would like to make an enquiry please do call me on 07813 536463 or get in touch via my Contact page. I also offer tuition at Higher Whitley through my programme of ‘Painting Nature in Pastel Pencil’ courses and I present demonstrations and workshops to local Art Groups. The theme of nature conservation features increasingly in both my painting and teaching work. My primary subject matter is wildlife, with recent projects focusing upon my particular passion – the wolf (see Wolf Paintings). A percentage of net proceeds from sale of prints of any of my wolf paintings is donated to wolf conservation. 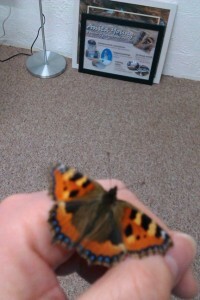 My web site gallery is currently being re-developed. More images and information coming soon. In the meantime please browse the images and information below and do not hesitate to contact me should you have any questions about my paintings, workshops or on-going projects – either via the Contact Me page or on 07813 536463. 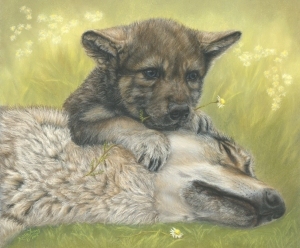 In the painting The Babysitter a playful wolf cub clambers onto his long-suffering babysitter who is trying to take a brief but watchful rest in a patch of wild chamomile. The calming herb may take a while to work its magic on this growing bundle of energy! To purchase ‘The Babysitter’ Limited Edition Prints please click here. In 2014 I began a project to create a series of narrative paintings exploring some of the challenges facing the natural world today – ‘Pictures of a Thousand Words’. The first painting in this series is a composition entitled ‘Glowing Embers of Ice’, released as a Limited Edition Print in October 2014, and featuring arctic wolves. Read more . . . .
To purchase ‘Glowing Embers of Ice’ Limited Edition Prints please click here. 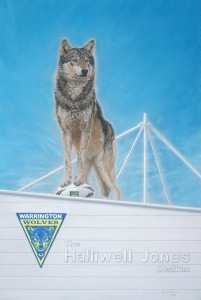 The painting ‘Spirit of the Pack’, combines my two loves of wolves and Rugby League! Completed at the end of 2012 and inspired by the incredible achievements of the Warrington Wolves Rugby League team over the previous four seasons – three times Challenge Cup winners, in 2009, 2010 and 2012, and winners of the League Leaders Shield in 2011 – celebrates the magnificence of the Warrington Wolves team, and of wild wolves, in one unique composition. Read more . . . .